During the past five years or so, we have seen many changes in the job search process. From online application processes to video resumes to phone screens, companies are thinking a lot more about how to make their recruiting process more efficient and effective. While these changes have streamlined things for job seekers, they have also brought new challenges. And nowhere is that more the case than with social media. For younger generations that have grown up with YouTube, Facebook, Twitter and, more recently, Instagram and Snapchat, they connect with people they know, take hundreds (or sometimes thousands) of photos with Smartphones, upload videos and create running visual “stories” of their daily lives that follow them through school and beyond. And while technology has provided us with these amazing ways of connecting with people and brands we admire, it has also given rise to a new set of challenges when it comes to the job search. Keep your personal profile(s) private. Yes, potential employers – especially larger, more traditional organizations - are conducting social media background checks and they will be asking the question: “Is this someone we want to represent our company?” If you have your profile open to the world and have posted photos of that college keg party, your judgement may be called into question. So we recommend that you play it safe and be sure to keep your personal profile(s) private whenever possible if it’s a social network that you use for personal reasons. Take advantage of the power of social media to maximize your reach. While there are some things to be cautious about, it’s clearly important to show the positive side of your social media engagement. It’s a good idea to follow the companies that you are interested in and with whom you may be interviewing. Show your interest by posting comments that will showcase your thought leadership, if appropriate. And consider including something in your profile that mentions a product or service that the company is known for – again, if applicable. It’s important to note that a recent CareerBuilder survey found that of more than 2,000 employers, “35% say they are less likely to interview job candidates if they are unable to find information about that person online.” So clearly it’s critical to take advantage of your social networks to ensure maximum visibility. Show your interest via social media by connecting with thought leaders, and particularly those who you interview with during your job search. While some hiring managers may not decide to accept an invitation to connect, others will and it can open the door to ongoing discussions. Be sure to join groups, follow hashtags and create lists that will showcase your areas of interest and expertise. And check back regularly to connect with the communities out on these networks. Don’t bash people or companies on social media networks. It may sound like a common refrain but we continue to see people making this mistake. Remember that the world can often feel like a small place; your old boss may know your potential new one and that former colleague’s husband might work in HR at that company you’re interviewing with. And even if there is no personal connection, potential employers will often see comments like these as being inappropriate and lacking judgment. So before you go venting about that former boss on your Facebook page, remember that you may wind up regretting those old posts in one way or another. All that said, job seekers are getting smarter about their social media actions over time. More and more, we see college professors and career coaches advising students and young professionals to think carefully about how they present themselves on social networks and online in general. As a rule of thumb, remember that you want potential employers to evaluate your abilities based upon your skillset and expertise, and not on some ranting comments that you posted 2 years ago. So be sure to use social media as a tool for good and not evil. Do you have questions about your online profile and how you can really build out your thought leadership presence on social networks? We’d be happy to help! 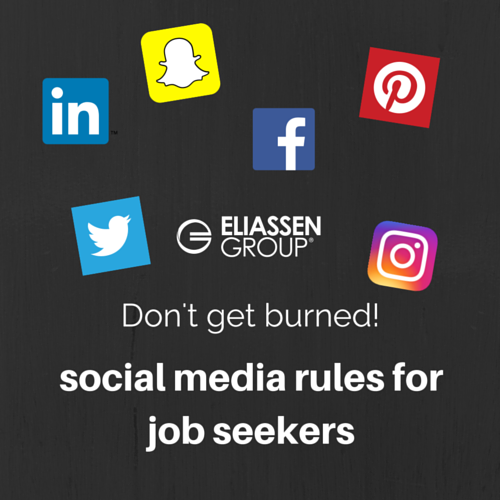 Send us a note to solutions@eliassen.com or reach out to us on LinkedIn or Twitter.